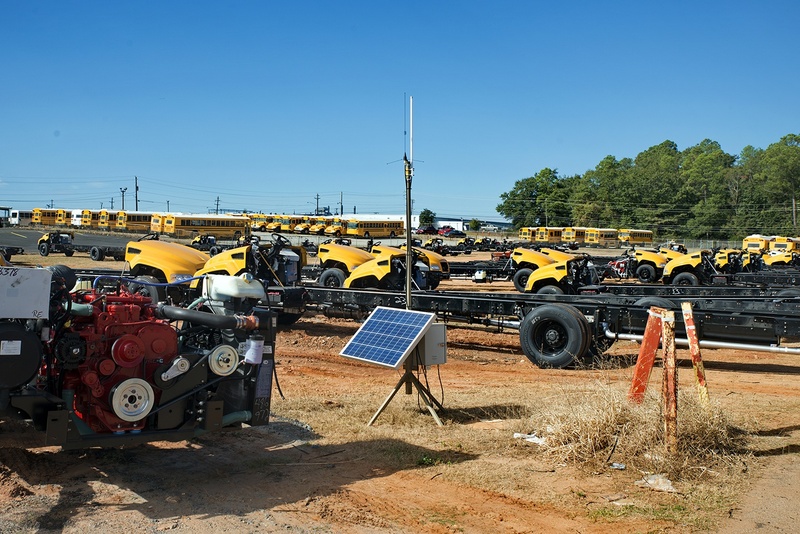 The GuardRFID solar powered system can be installed at remote industrial yards, oil & gas wells and platforms and monitored from a centralized corporate data center utilizing a wi-fi connection to the AllGuard server. The system operates in the 433 MHz UHF band, which is proven to perform reliably in the most difficult industrial environments. The technology is compliant with the IEEE 802.15.4:2014 standard and operates in a frequency band that is suitable for global consumption and not constrained by local regulatory requirements. The Solar Powered Tag Readers and Solar Powered Tag Exciters are mounted on tripods for ultimate portability and ease of installation. Solar powered with 7-day backup battery. Long communication range and tag detection enabled by high gain Wi-Fi and 433 MHz antennas. Solar powered with 7-day backup battery at maximum field strength. Instant tag detection up to 30 feet distance. Outdoor Tag Reader (OTR): The OTR features a Tag Reader Controller inside a NEMA 4 rated enclosure for outdoor use. The controller detects tags, controls doors, and works with the AllGuard server to provide you with intelligent location tracking and active alarm response. The durable, waterproof enclosure allows you to install the OTR in many outdoor environments, while providing you with the ability to detect tags in large industrial environments. The OTR supports Wi-Fi network communication when installed with an Ethernet to Wi-Fi Conversion Kit. Outdoor Tag Exciter (OTE): The OTE features a Tag Exciter inside a NEMA 4 rated enclosure for outdoor use. The exciter creates a low frequency field that triggers an active tag to report its position to the AllGuard server. The AllGuard server uses this information to provide accurate location tracking and activate configured alarms. The OTE is designed to be used with a Tag Reader Controller and AllGuard server as part of an end-to-end system. Staff Duress – providing the ability for personnel to send panic alarms using active RFID badges or tags equipped with push buttons to summon assistance. Fall Detection – the ability to automatically send notifications that a tagged person or object has fallen. Monitoring Personnel Competency – detecting tagged personnel entering highly hazardous zones to ensure that they are competent, certified, and were appropriately equipped and authorized to enter such areas. Dwell time within hazardous areas – monitoring the amount of time personnel spend within a hazardous environment to ensure ‘safe’ limits are not exceeded. Process analysis and enhancements – studying personnel and equipment movements and utilization to determine changes to affect positive process improvements. Monitoring safety equipment – ensuring that adequate critical emergency equipment is in place and available; creating warnings if they fall below required limits. Equipment tracking – monitoring equipment movement and utilization within zones for accounting purposes. Equipment location – rapidly locate critical equipment when required, saving time and ensuring timely execution of scheduled activities. Equipment loss prevention – detecting unauthorized movements of equipment and other assets to prevent their loss. Real-time inventory visibility – having constant and real-time awareness of all valuable assets within a facility and monitoring their movement from one location to another. EX-Rated Tags: AT-4BLF-Ex, ST 3BLF- Ex, IT- 2BLF- Ex are IECEx certified for use in hazardous gas atmospheres (Group II), with protection type “ia” (Intrinsically safe). They can be used in areas designated as Zone 0. These products are designed for employee accountability, lone worker safety, employee mustering, and asset tracking applications. Industrial Tag Exciter (ITE-Ex) is intended to be used in hazardous gas environments requiring IECEx certified equipment. The ITE-Ex is AC powered with built-in surge protection. Its fully sealed enclosure is intended for installations in outdoor environments with extended temperature ranges. The ITE-Ex is IECEx certified for deployment in hazardous gas atmospheres (Group II), with protection type “nA” (increased safety). It can be installed in areas designated as Zone 2. The Industrial Tag Reader (ITR-Ex) is intended to be used in hazardous environments requiring IECEx or ATEx certified equipment. The ITR-Ex is AC powered with built-in surge protection, and uses the 433 MHz frequency band to communicate with RFID/RTLS tags. The ITR-Ex is IECEx certified for deployment in hazardous gas atmospheres (Group II), with protection type “nA” (non-sparking). It can be installed in areas designated as Zone 2.